Azure Media Services supports many popular streaming formats, such as Smooth Streaming, HTTP Live Streaming, and MPEG-Dash. This topic points you to existing players that you can use to test your streams. 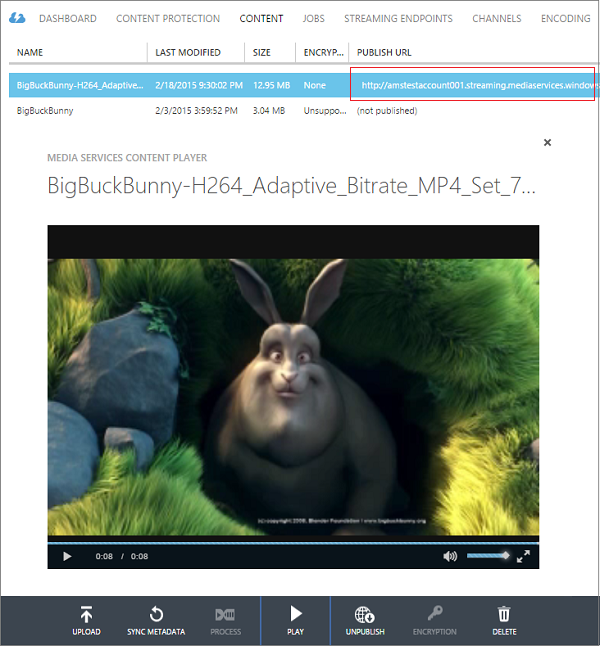 The Azure portal provides a content player that you can use to test your video. Click on the desired video (make sure it was published) and click the Play button at the bottom of the portal. The MEDIA SERVICES CONTENT PLAYER plays from the default streaming endpoint. If you want to play from a non-default streaming endpoint, use another player. For example, Azure Media Player. 3ivx HLS Player on Windows.